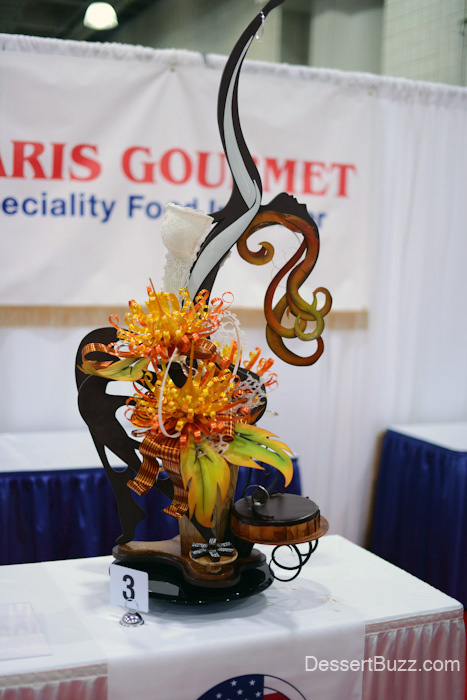 The 24th annual US Pastry Competition sponsored by Paris Gourmet took place yesterday at the Javits Center in New York City. 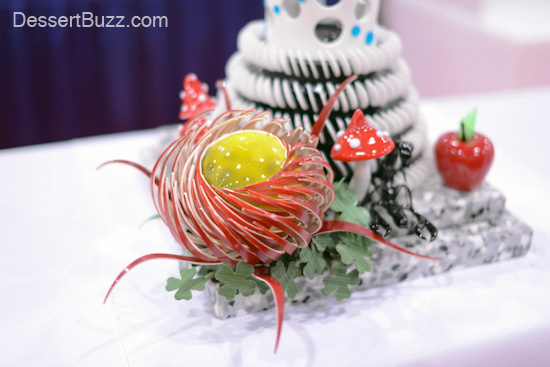 DessertBuzz was there to bring you our usual, behind-the-scenes coverage you won’t find anywhere else. You can check out some highlights from yesterday via our Twitter feed. We’ll be updating this post throughout the day. 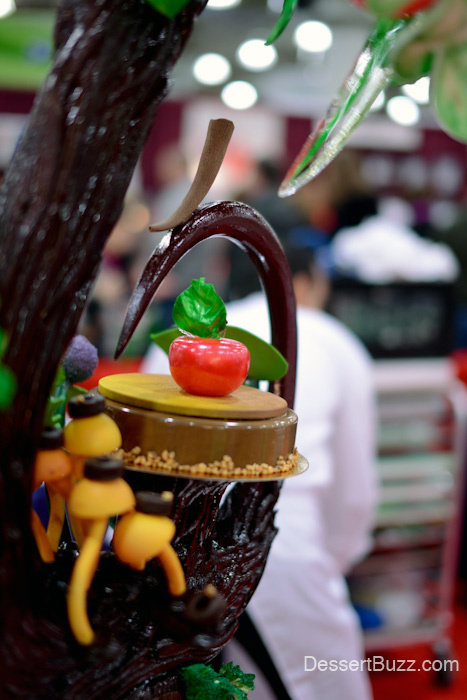 Detail from Ben Shelton's display piece - the apple signified "temptation"
A New York City affair: There were a lot of NYC-based pastry chefs at the competition. 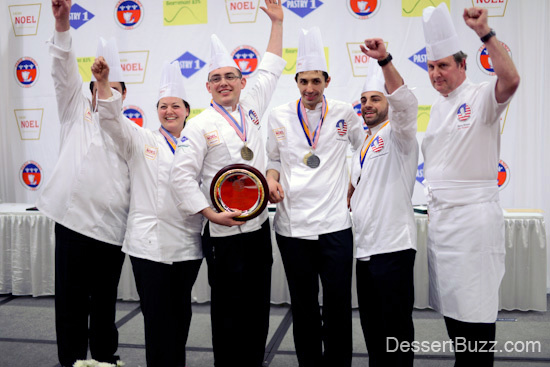 To be exact, seven out of the fifteen participants were from the five boroughs, and more than half of the judges too! 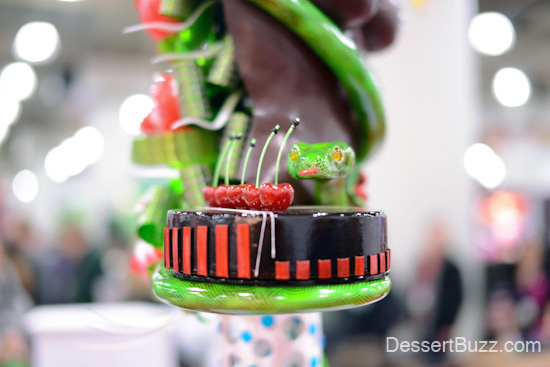 Despite the home court and home judge advantage, non-New Yorker, Pastry Chef Ben Shelton from PreGel America took home top honors. 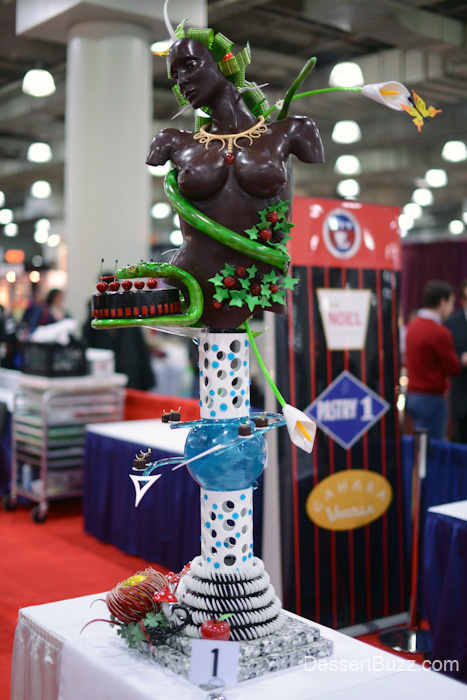 Daniel’s Sandro Micheli took second and Maura Metheny from Norman Love Confections took third. 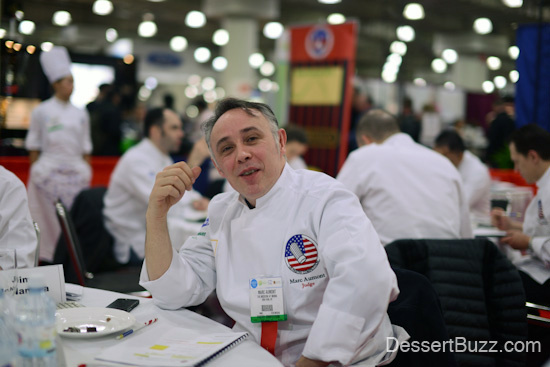 Salvatore Settepani from Pasticceria Bruno Bakery was an honorable mention. 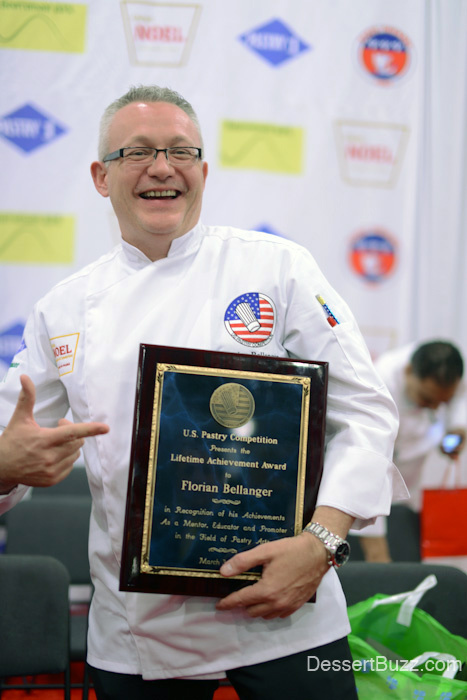 Florian Bellanger also received the Lifetime Achievement Award. The judges: Despite brief moments of levity I was struck (and am always struck frankly) by how seriously the judges take their responsibilities. 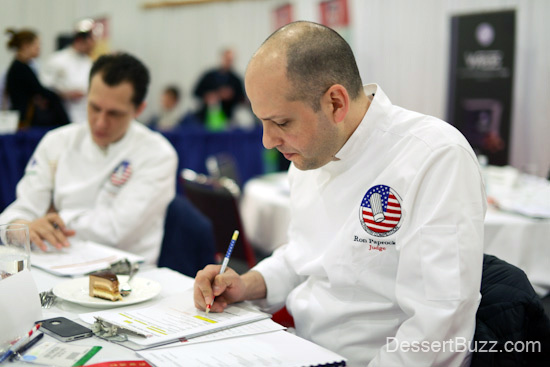 Without exception each judge takes a huge amount of time tasting and viewing the entries. Every juror has their own style too. 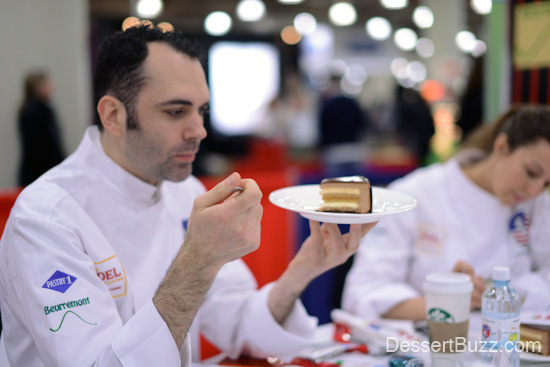 Some, like Dominique Ansel, hold each slice of cake up to eye level and stare at it for a while. Others like Georges Berger, MOF puts on his reading glasses and simply observes the cake on the plate for a minute or two. I asked Michael Laiskonis if it’s hard to judge 15 different pieces of cake and specifically, how he keeps track of all the different cakes. He explained that he doesn’t really have to keep track of them because they are all different and are all being judged against a standard rather that against one another. 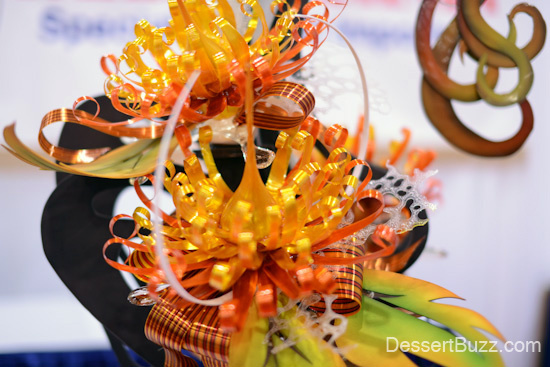 He said that if he was judging 15 cakes that were all the same, milk chocolate mousses, for example, it would be challenging. 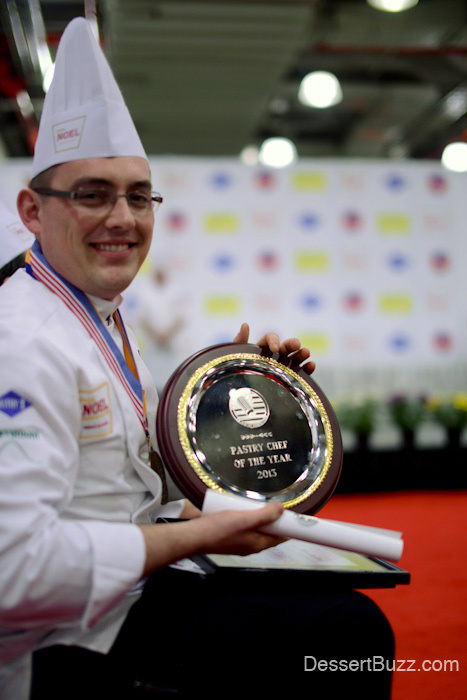 Ron Paprocki of Gotham Bar and Grill. 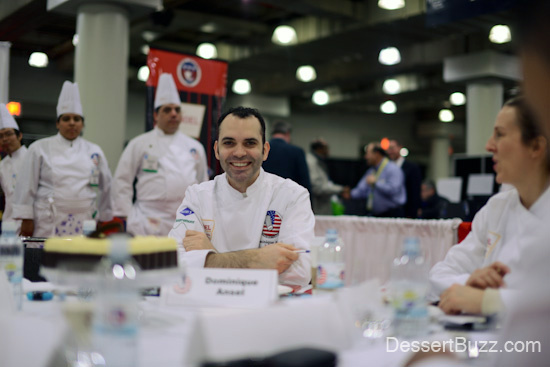 I didn't get a chance to ask him ho the late night three-dessert-tasting was going. Bloggers weren't the only ones taking pictures! 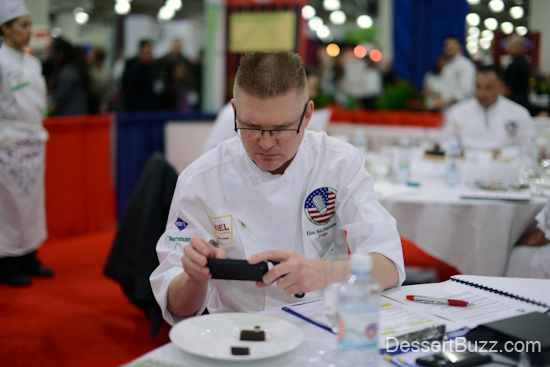 Judge Jim McNamara snaps a shot of this Bon Bon with his phone. 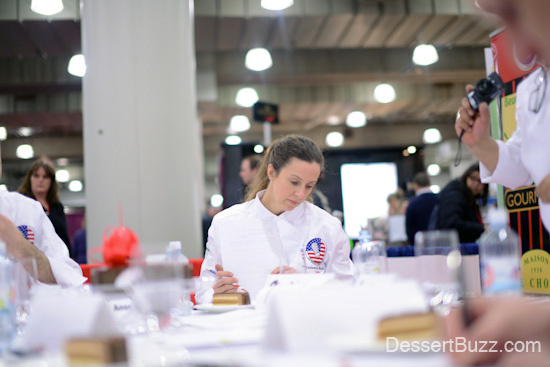 Competing isn't nearly as exhausting as judging! 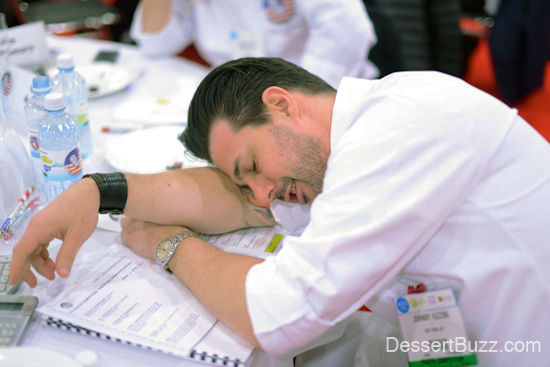 Iuzzini grabs a few "Z's" in between cakes (in truth he was just hamming it up for this shot). 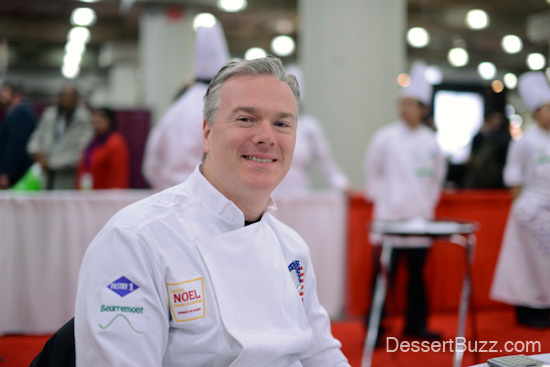 Ansel says he enjoys being a judge at these competitions because it gets him out of the bakery and out seeing what [other chefs] are working on. 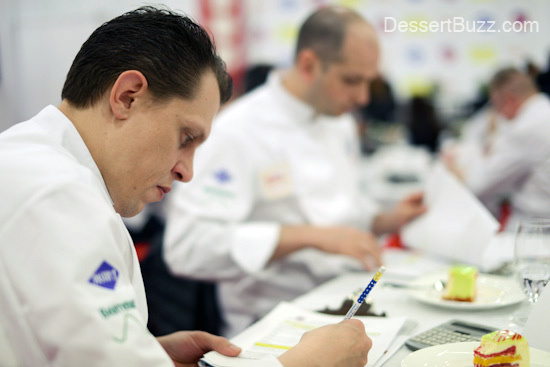 Hi, i just see how it s possible Salvatore Settepani is competting, and Biagio Settepani is in the jurrors? Samos, I didn’t even notice that. I’ll try and find out if he recused himself or something. In any event he got an honorable mention vs. main placing. 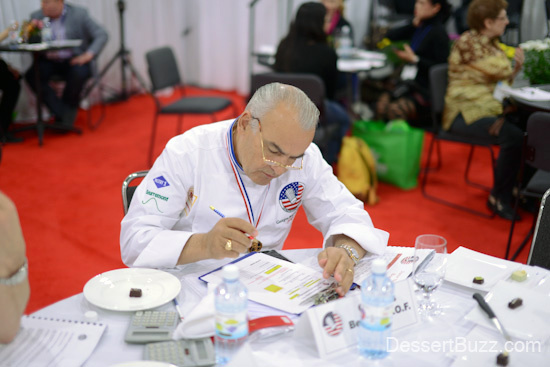 Biagio only judged the junior competition and was not involved in judging the main, US Pastry Competition his son was competing in. The State rayban サングラス General Superintendence of Attribute Supervision, Inspection and Quarantine announced yesterday that the 2012 conventional rayban wayfarer optical linkage checks showed, sunglasses, eyeglass frames two types of products value mouthful pass assess of 90.9% and 91.5%, respectively. Sunglasses products bustling in the main http://sunglasses.amigasa.jp characteristic problems are luminescence telecasting volume, logos and other projects failed; spectacle frames faked the biggest レイバン rank problems are inter-chip stiffness, plane lens dimensions of the battle method, メガネ フレーム 人気 anti-sweat corrosion propel failed.The proceeding, a tot up of 261 glasses manufacturers and 507 in Beijing, Tianjin, Shanghai and other places eyewear assignment order carried effectively レイバン アビエーター precinct checks. Involving 237 movie (including commission processing) production ポリス メガネ of 351 batches of sunglasses and 389 origination (including the commission processing) shaping of 551 batches of spectacle frames products. レイバン 店舗 Blotch checks start that a all-out of 32 batches of substandard sunglasses, defraud frames a total of 47 batches of substandard.